This tutorial project is a tutorial and demo for programmers on the effectiveness of Wang Tiles for generating random 2D maps for games using tiled maps. Wang Tiles are designed so that no matter how placed, the edges always line up. Included is my custom designed animated chains and pulleys tileset, and link to an website explaining Wang Tile in great detail. That's an interesting topic! 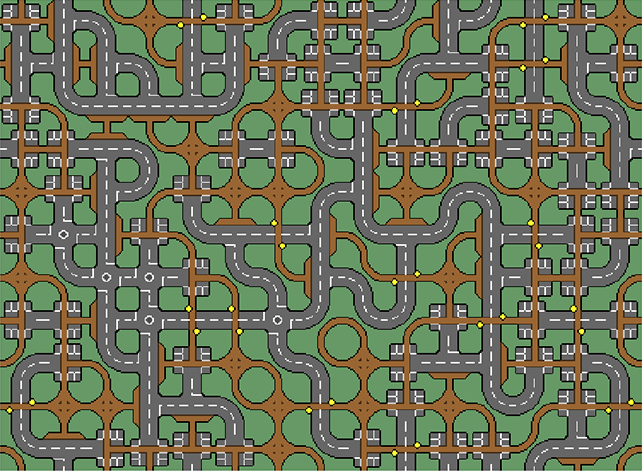 Randomly generating plausible (sub)urban maps can be tricky, so any technique that helps is welcome. But Firefox refuses to run your demo; are you by any chance loading remote resources over unencrypted HTTP? Fixed, thank you! Was a remark I left in my HTML file that affected Firefix but not Chrome, I'v been using Chrome so I missed it. Scratch projects are hosted at MIT (usually) and linked here via HTML, which is pretty handy for updates.